This article is from the online version of the Wall Street Journal. “Of course we’re going to embrace any technology that makes us feel more connected,” Prof. Perlin says. A global survey of attitudes toward technology in the workplace suggests he may be right. The survey, in a report from Dell Inc., Intel Corp.and consultants Penn Schoen Berland, found that 57% of employees around the world prefer face-to-face conversations with colleagues. But more than half said that better communications technology could make such interactions obsolete in the future. Millennials particularly were open to using virtual- and augmented-reality products at work, with 77% saying they would try it. 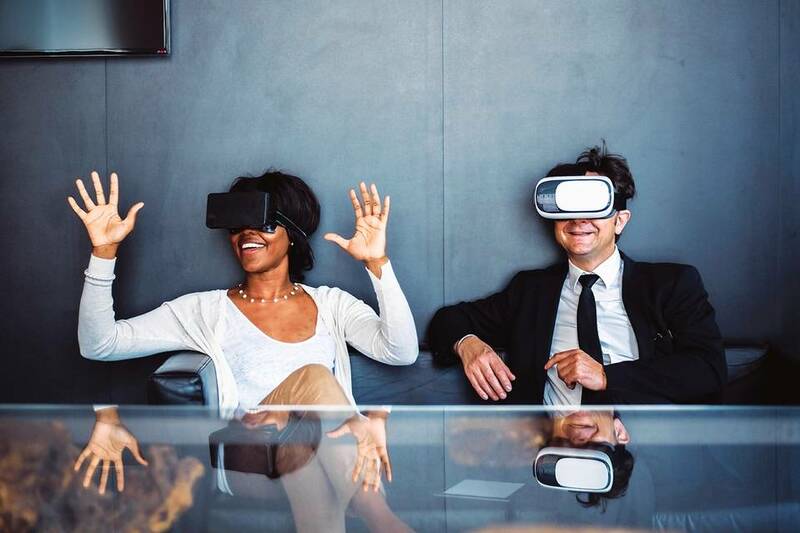 Jeremy Bailenson, the founding director of Stanford University’s Virtual Human Interaction Lab, says business calls using virtual-reality technology can offer many benefits over videoconferencing. “VR meetings will allow for nuanced nonverbal communication—proper eye contact, subtle cues such as interpersonal distance, and eventually virtual touch and smell (when desired),” Prof. Bailenson writes in a recent email. Mr. Harlick told The Wall Street Journal that his firm has been experimenting with several virtual conferencing centers. He said he doesn’t see virtual reality replacing video calls, but that it provides functions that other office collaboration tools do not offer. He said he thinks it will help his team be more effective in how they communicate. The National Grid employee who tweeted, David Goldsby, said a team he presented to was “seriously impressed” by the technology. However, he said the Wi-Fi in their hotel presented challenges. The company didn't respond to a request for comment. Still, for many companies, experts say virtual-reality meetings may offer real improvements over the typical videoconference experience. Some of the earliest adopters are in videogaming and the virtual-reality industry itself. Neil Glenister, founder of a London-based gaming company called 232 Studios, says his team has typically conducted lengthy weekly group meetings on Skype. But the team, he says, is tired of videoconferencing. It doesn’t make them feel as if they are in the same room, he says, and they have trouble seeing each other’s hand gestures. Instead, Mr. Glenister and his team recently tried an app called vTime, which allows people to meet in virtual environments using avatars. From a menu of possible settings, Mr. Glenister and his employees chose to meet in a simulation of outer space. At times, he says, they struggled to focus on work-related topics because they were distracted by the planets surrounding them. Skype, which is owned by Microsoft Corp., didn’t say if it has developed a virtual-reality application, but a spokesman says the company is testing the waters in augmented reality, a close cousin of virtual reality in which a viewer sees digital images imposed over real-world environments. Skype says it has developed an application for the HoloLens, Microsoft’s augmented-reality device that is currently only available to developers. Something else that virtual reality provides that video calls typically don’t: eye contact. Though they’re looking through their avatars’ eyes, participants in a virtual-reality meeting get the feeling they are making eye contact, says Eric Romo, chief executive of AltspaceVR Inc., a Redwood City, Calif., company that designs environments for virtual-reality meetings using avatars. Some virtual-reality companies are experimenting with eye-tracking technology that would allow the goggles to better track users’ eye movements and convey even more realistic eye contact. In a typical video call, by contrast, a participant may think he or she is making eye contact, but to the other person they appear to be looking down. Instead of looking directly at each other’s image, you have to look into the camera for the other person to get the feeling you are looking into their eyes. Other kinds of physical cues missing from most telecommunication may be incorporated into virtual-reality calls as well. While arms are frequently out of sight in video chats when people are sitting close to the camera, some virtual-reality headsets are able to capture arm and hand gestures that are then imitated by an avatar. Participants can get visual insights into group dynamics, as well, such as how close certain avatars stand to one another. “There are all these nonverbal cues we have physically that we don’t have in [most] communication technologies except for VR,” Mr. Romo says. One of the biggest challenges today for companies creating meeting spaces in virtual reality is to make avatars that realistically capture and instantly reflect the users’ emotions. Some companies are putting transitional technologies, like emojis, into their virtual environments. But companies are experimenting with technologies that would allow avatars to capture facial expressions. Another hurdle that technologists are addressing is capturing fine movements. With hand controllers, avatars can imitate simple gestures, like waving a hand. Researchers and businesses are pushing to capture finger movements. Other impediments remain as well. Even if a person or a business invests in the equipment needed to hold a virtual-reality meeting, the equipment is still relatively rare. Others have to invest as well for meetings to be possible. Early headsets that use mobile phones also have very limited battery life, connectivity issues and can overheat. If virtual-reality meetings do catch on, researchers are at odds over whether they will dramatically change the amount of business that people conduct in person. Prof. Bailenson says he believes that adoption of virtual-reality meetings will result in a major decline in commuting. Prof. Perlin, meanwhile, says the impact of virtual-reality meetings will be similar to other communication technologies that have come before.